"You are extremely brave and wise for one so young." In one of ADV's darker moments, Ninja Resurrection went down in history as something of a blemish on their record for publishing anime. 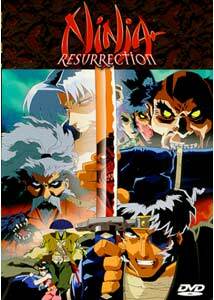 At the time it was released, another anime movie entitled Ninja Scroll was extremely popular, and the marketing for Resurrection was misleading to say the least, leading people to think it was a sequel. The same font was even used on the cover and, as a result, a lot of people who bought the disc (or tape) were greatly disappointed. In retrospect, it was the fault of viewers that didn't pay attention to the details; still, I can't help but think ADV should have distanced it more than they did. In fact, why this disc is called Ninja Resurrection at all is beyond me, as it's an unfitting title for the contents within. All that aside, Resurrection is still a difficult DVD to review. Part of me wants to give it all 'A's, but then part of me knows that it is actually incomplete, so it's very hard to do so. Resurrection is set in 1630s Japan, a time during which great political battles were waged and Christianity was outlawed. In the two episodes featured on this disc, the plot deals with a small, Christian community assaulted and ravaged by a government-sponsored force of warriors. These Christians subscribe to a series of philosophies made some years earlier by a missionary who claimed that the second coming of Christ would occur from within this community. Indeed, the people think that Shino, a young swordsman, is the leader of their cause who will one day become the new messiah. Using powerful sorcery, Shino and his supporters are able to fortify themselves against opposing forces. This changes, when a Yagyu warrior, Jubei, and his swordsman friends are sent to dispatch the Christians. These warriors may not agree with their mission, but Christianity is against the law. To make a complex story short, in their victory over the Christians, Jubei and his friends inadvertently help evil forces operating with the Christian camp that wish to turn Shino into an instrument of evil. If Shino's cause can be stopped, according to prophecy, he will not become a messiah, but rather an antichrist who will bring about hell on Earth. How this progresses is basically the meat of the two episodes here, but make no mistake, this is far more than your usual political drama in anime. Ninja Resurrection is ultra-nasty, with extremes of violence in virtually every way, with brutal action every few minutes. If this was all that it was about, it'd be pretty lame. I hate gimmicks of violence and gore when there's nothing to back it up. Luckily, everything is so intense, you scarcely have time to think about the brutality. From a giant stone dragon to an undead swordsman who uses his disemboweled organs as weapons, Resurrection throws the kitchen sink at you. It doesn't just rely on 20 minutes of idle threats from one opponent to the other, it actually delivers on promises of excitement. For all its intensity and fierce power, there's one problem: Ninja Resurrection was never finished. Episode 2 ends with the cliffhanger of all cliffhangers and that's it; imagine, for example, Star Wars ending right before the final assault on the Death Star. Originally intended as a limited series, it would appear that the creators of this project never continued their work. It doesn't look like we'll see more episodes anytime soon, and what's so frustrating about that is that we really only need another 20-30 minutes to complete the story. So, we have an awesome, pedal-to-the-metal samurai film that's basically missing its third, most important act. As a result, it's difficult to praise the story when it's incomplete. I will say what is there is solid. It may not be historically accurate to the period (i.e., transforming robot armor), but who really cares? It's a roller-coaster ride of pure swords-and-sorcery insanity and I think it's certainly worth seeing, even if one must endure the lack of resolution. Image Transfer Review: Other than a weak, tacked-on opening sequence (ADV put the trailer before the feature forsome odd reason), the image quality is solid and very crisp. Although there is some grainin the more traditional cel animation, it doesn't bring out any compression problems. Ofcourse, the natural sharpness and clarity of the transfer means that moire patterns show onon edges of things and there is some color interlacing, but this is all display-oriented. Audio Transfer Review: English and Japanese audio is Dolby 2.0 Surround, and makes good use of the surroundchannels for some much-needed ambience in certain scenes. The front soundstage is veryloud and active, with a good amount of stereo effects. The orchestral soundtrack reallyswells and gets very theatrical on many occasions. Overall, the audio is very much whatthe show deserves and works well. The English dub, however, isn't that great. It'sfunctional, but given the deep roots in Japanese occultism and religious/historical events,the rather weak dub takes away some of its credibility. Extras Review: There is a still gallery of work from the film, but nothing else really (other than ADVpreviews: Battle Angel, Neon Genesis Evangelion, Slayers, Sorcerer Hunters, Burn Up Warrior, Dirty Pair Flash). The presentation is nice, butsome of the back cover text is a little goofy sounding ("To kill with hunger and death..."). It bears mentioning that Ninja Resurrection is extremely savage, upsettingly so. It is not for the kiddies and may not be to the taste of many viewers. The reason it didn't upset me, though, is because unlike a lot of anime, the violence is accompanied by real action or an earnest need for it in the plot: The dark and grim nature of the story unfortunately demands much of what goes on. I have no problem with that when it delivers the goods, but I do dislike it when it is exploitative. Of course, the religious issues will also turn off certain viewers; I can't say the program is very kind to Christians. Underneath all this, however, I feel Ninja Resurrection is a very brave and gutsy action film.